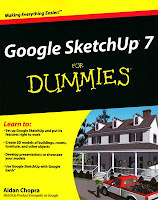 I bought the previous SketchUp for Dummies book and found it very informative; it has saved me a lot of time by showing me what not to do as well as what I should do to accomplish my modeling goals. It looks like I'll have to pick this edition up as well. I do wish these weren't "Dummies" books, though. After all, I'd like to think I'm no dummy. I use SketchUp! i will but this book, because i already buy the early edition before. I hope i will become more expert. I browsed the entire website but found none "color images" available! and in the chapters, all the times readers are referred to 'Color Plate 1, See Color Plate 2-4, 2-5, 6, etc.' all are just not there in the website!! !